The Tron has been a familiar landmark in Glasgow's Merchant City, easily recognised by the 16th century church steeple. In fact, the home of The Tron Theatre has always played an important part in the rich history of the old industrial city. The building started life as St Mary's Church in 1637 before being almost completely destroyed by a fire which was started by a couple of drunken members of the notorious Hell Fire Club in 1793. The only part of the building to survive was the now famous steeple which was incorporated into reconstruction work by the architects, James & Robert Adam. Over the years the building has been place of execution, a meeting hall, a market and a store house, a police station and a theatre. Whilst long respected for its theatrical offerings, The Tron Bar & Kitchen is gaining a reputation for offering good food. In addition to traditional pre-theatre meals or after show drinks, the kitchen serves up light lunches, snacks and wide range of homemade meals. As LittleGems Jewellery was exhibiting at a craft fair that was being held within the Tron last weekend ,( and I was helping), we were able to try try out their excellent value lunchtime menu. The menu boasted a wide selection of light snacks and sandwiches as well as hearty burgers and baked potatoes. The range of fillings for the sandwiches was huge, and after changing her mind a few times, Nicola decided to get the goats cheese and red onion marmalade sandwich. What she received was two massive doorstops of fresh bloomer bread, filled to the gunnels with creamy, slightly salty goats cheese and a tart marmalade of red onion which gave the perfect balance to the distinctive flavours of the cheese. 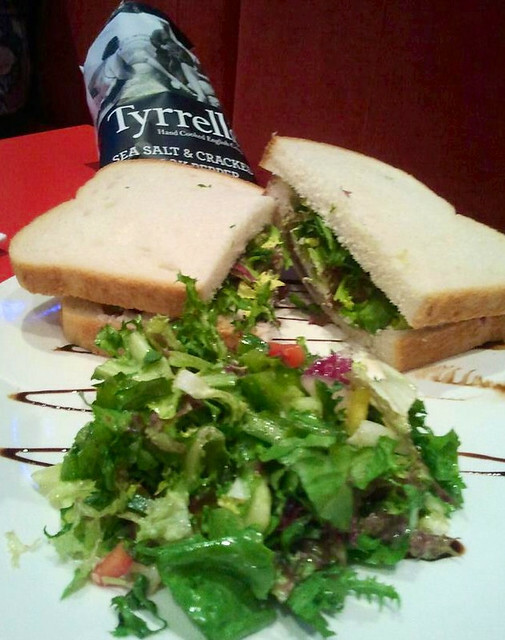 The sandwich was served alongside a garden of mixed salad leaves dressed in a light mustard dressing. Although I was tempted by the sound of their homemade burger, I decided to order the 'soup and sandwich'. I don't know why but I had been expecting a creamier soup, however the chef had kept the soup very simple using just stock, broccoli and a little Stilton. The soup was deliciously flavoured and well seasoned. To accompany my soup I had opted for the Coronation chicken sandwich. Like Nicola's sandwich, mine was packed with tons of filling and loads of flavour. 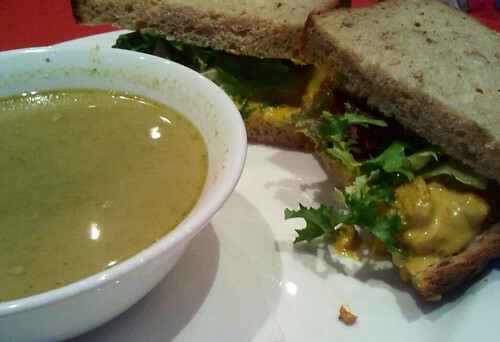 The Coronation chicken was a fanatic blend of diced chicken breast, mayonnaise, and curry powder, served with dressed salad on two huge chunks of wholegrain bread. The bar serves up a wide range of bottled and draught beers and lagers including locally produced St Mungo which is brewed less than a mile from the Tron at West Brewery on Glasgow Green. The award winning German style lager was a perfect way to round off my lunch. Lunch for two including a pint of lager, a diet Coke, and a packet of crisps came to just over £13. With excellent portion sizes packed with flavour, we would definitely return in the future. If you're ever near Trongate and in need of some sustenance then make sure that Tron Bar & Kitchen is somewhere in your thought. 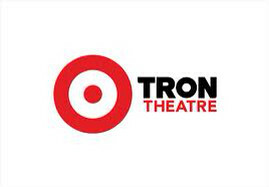 Keep up to date with Tron Theatre on Facebook & Twitter.